Last year, Whole Foods Market made waves by establishing the Animal Compassion Foundation. A handful of animal activists were invited to join meat producers, animal welfare experts and executives to devise the best living conditions possible for farmed animals raised and slaughtered for the display cases of Whole Foods. 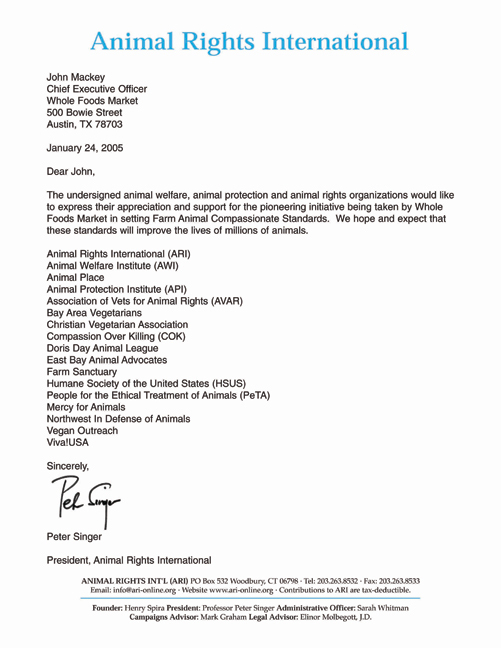 This move was embraced by many animal rights and protection organizations. When we at Satya discovered this letter it gave us pause. And made us ask questions and investigate. Eventually we will see animal products sold in Whole Foods with the Animal Compassion logo on them. What does it mean when body parts of dead animals are emblazoned with some of the words most precious to the animal rights movement? Humane. Compassion. Free. What does it mean when animal protection organizations publicly endorse and direct resources into supporting such programs? What does it mean when a major corporation like Whole Foods uses this endorsement and involvement to promote their efforts? Walk into any meat or dairy section of your local grocery or natural foods store and you’ll notice the labels: “Certified Humane,” “Naturally Raised,” “Cage-Free,” “Organic,” “Free-Range” and so on. These give the vague impression that the animals used or killed are given a certain level of consideration, allowed a somewhat natural life. While a handful of these labels adhere to solid guidelines, many of them are simply marketing ploys designed to help consumers feel good about the products they are buying—animal exploitation with a smiley face. If the label says it’s okay, is that when the critical thinking stops? More and more we’re hearing “What about ‘humanely raised’ meat?” or “I used to be vegetarian…” or “It’s okay, I only buy free-range…” And over the past few months there has been a flurry of books and articles exploring similar sentiments. Part of this indicates our success: people are talking about and examining their food choices. But it’s the solutions they seem to be grabbing on to, their conscientious carnivorism, that makes us take notice. Are we somehow sending mixed messages to the general public, perhaps even giving them excuses to keep eating meat? No one is disputing whether animal activists care. Anyone working to reduce the suffering cares. It’s the question of strategy and direction that is in debate. This is not about Whole Foods. It’s not the over-simplified animal welfare vs. abolition argument. This is about the consistency of our messages and actions and their consequences. It’s about the 10 billion animals killed for meat each year in this country—humanely raised or not—and what we’re doing to stop that. In this issue and the next, Satya explores what has until now been quiet rumblings. Readers will be exposed to many sides of the debate. We encourage readers to continue the dialogue beyond our pages and invite you to participate in our online discussion forum. The more we discuss the issues, the more likely we are to discover common ground and develop solutions. The animals are counting on us.